The species is widespread in south-central and south-eastern England, south of a line from the Severn to The Wash, with very scattered records elsewhere as far north as Lincolnshire and in Wales. It has been recorded from France, Belgium, Switzerland and the Iberian Peninsula. 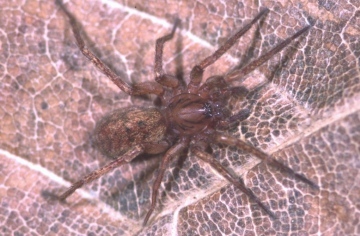 This species can be found amongst grass tufts and other low vegetation, most usually in fairly dry open situations such as calcareous grassland, but also in the leaf litter of woods and on sand dunes. It has been found occasionally on heathland, usually in open stony areas. The period when males are mature appears to be shorter in this species than in those of A. brunnea and A. proxima. Adults of both sexes are mainly found in the autumn, although occasional adults are found the following spring and females until summer. This is a local spider, possibly showing some decline. Agroeca species are probably under-recorded unless survey is undertaken late in the year. Given its wide range of habitats, it is difficult to be certain what the threats to this species are. Until more is known of its ecological requirements, precise recommendations cannot be provided.